General view of the shelter over destroyed 4th block of Chernobyl Power Plant in April 2012. Work to build a permanent shelter to secure the exploded reactor at the Chernobyl nuclear power plant in Ukraine reached a key milestone on Tuesday when workers raised the arched section that will cover the destroyed unit. Work to build a permanent shelter to secure the exploded reactor at the Chernobyl nuclear power plant in Ukraine reached a key milestone on Tuesday when workers raised the arched section that will cover the destroyed unit. 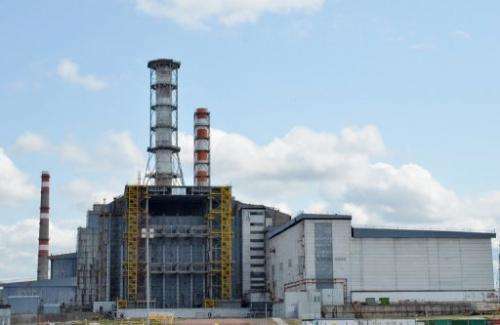 The explosion at reactor number four at the Chernobyl power plant in the early hours of April 26, 1986 sent radioactive fallout into the atmosphere that spread from the Soviet Union across Europe. It remains the world's worst nuclear accident. The structure raised to its full height on Tuesday will be part of the so-called New Safe Confinement, a colossal arch-shaped structure which when completed will be slid on rails over the existing sarcophagus covering the reactor. During the initial lifting operation, around 5,000 tonnes of steel was raised to a preliminary height of up to 22 metres (yards), according to the European Bank for Reconstruction and Development (EBRD). The EBRD is administering the fund to build the shelter with the help of donor contributions. "This is a very significant milestone, which is a tribute to the ongoing commitment of the international donor community, and an important step towards overcoming the legacy of the accident," EBRD President Suma Chakrabarti said. When it is finished in 2015, the structure will weigh 20,000 tonnes and span 257 metres (843 feet). It is designed to last for a century and will contain hi-tech equipment to carry out safe decontamination work inside the ruined reactor. Chernobyl is only around 100 kilometres (60 miles) from Ukraine's capital Kiev and lies close to the borders with Russia and Belarus. The area around the plant is still very contaminated and is designated as a depopulated "exclusion zone". Two workers were killed by the 1986 explosion and 28 other rescuers and staff died of radiation exposure in the next months. Tens of thousands of people needed to be evacuated and fears remain over the scale of damage to people's health. In 1986 and 1987, the Soviet government sent more than half a million rescue workers, known as liquidators, to clear up the power station and decontaminate the surrounding area. However the death toll at Chernobyl remains a subject of bitter scientific controversy, with estimates ranging from no more than a few dozen deaths directly attributable to the disaster to tens of thousands.